SUMMARY: Samantha Reed's pristine life with her sister and senator mother may seem "picture perfect," but it is far from that. Samantha never worries about money. She attends a top-notch private high school. Her house is tastefully decorated and impeccably clean. Trapped in a false image of perfection, Samantha longs for more and spends lots of her time watching the Garrett Family next door. With eight children, the Garretts are loud, messy, and broke--everything Samantha's mother despises. When Jase Garrett, the Garrett's third-oldest child, approaches Samantha one night and introduces himself, both Jase and Samantha fall hard for each other. Knowing her mother would disapprove, Samantha struggles to keep her relationship a secret. 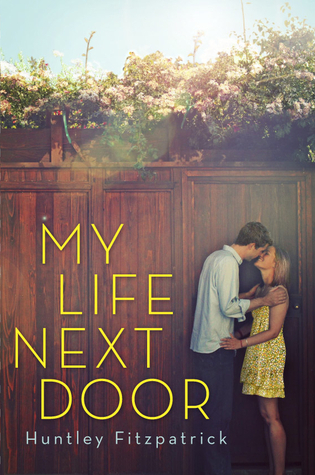 REVIEW: Despite huge Goodreads reviews, this book was just okay for me. I slogged my way through the story for nearly two weeks. It is the beginning of the school year, so I read more slowly than usual, but I never felt compelled to read My Life Next Door compulsively. There always seemed to be something more important to do, something I cared about more than finishing this book. I liked the characters--Jase and Samantha are perfectly nice and their relationship is sweet. They seem like very normal teenagers with normal problems, and I'm sure lots of teens will relate to them. The story is realistic and believable. My problem with this book is that, while everyone is nice and everything, it is really pretty boring. I really liked Tim's character and, despite my lukewarm reception of this book, I would probably read a book written from his perspective. The conflicts are relatively minor until near the end, when a catastrophe comes out of the clear blue and finally introduces some tension between the lovers. By then, I just really didn't care anymore. THE BOTTOM LINE: It's okay if you like "slice of life" fiction. The romance is sweet and realistic, but it just doesn't have enough conflict to keep me turning the pages. STATUS IN MY LIBRARY: We can't get it--it is very high school. Great review. I seen this, but haven't got a chance to pick it up. Thank you for sharing it.